The Rev. Dr. Anita Stuart-Steva M.Div. ’04/D.Min. ’13—the 2017 Fred McFeely Rogers Award for Creative Ministry recipient—was heading for a career as an opera singer. But God had other plans. Now, instead of performing on the opera stage, Anita stages creative worship services for the families who make up the congregation of Middle Creek Presbyterian Church in Winnebago, Ill.—where she’s pastored for the past dozen years and counting. Back up a few years. Anita earned a bachelor of arts in music from Edinboro University of Pennsylvania, then a master of fine arts in vocal performance from Carnegie-Mellon University. At the same time, and responding to the need of her church for someone to fill a sudden vacancy in its music ministry, Anita began what turned into a 15-year “stint” in music, youth, and children’s ministries at several Pennsylvania churches. That service gave Anita more than enough time and experience to sense God’s call to the ministry over the opera. So she enrolled at PTS to prepare for an expanded pastoral role. But she didn’t leave music behind. A merit scholar here, Anita made outstanding contributions to the Seminary community in the area of church music—and, upon graduating with her M.Div., received the Watson Samuel Boyce Music Prize. A few months later Anita was ordained and installed as pastor of Middle Creek, where she promptly launched her creative ministry in an approach of permission giving and encouragement. She draws on the wide variety of her life’s experiences to create ministries that relate to all ages and interests, so that instead of separating children and adults in worship, families can worship God together in engaging and meaningful ways. Busy people tend to get a lot done, and few are busier than Anita! 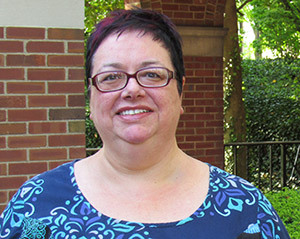 In addition to filling her pastoral role at Middle Creek, she serves as the Community Spiritual Director of Illinois Credo Recovery, which helps men and women recover from addiction through the indwelling power of Jesus Christ. And not only did she serve as alumnae/i representative on the Seminary’s Board, but she also pursued—and earned—a Doctor of Ministry in Reformed theology while serving the church.